self-disclosure, acceptance, being listened to and understood. In therapist speak the terms are congruence, unconditional positive regard, empathy and presence. What I dig most about Rogers is he believed that people were essentially good and healthy. His voice was different then the accepted thought of his time. I see him as a courageous pioneer. He saw the goodness in people when determistic Freud and other abnormal theorist were shouting from the roof tops. During the year I will post much about Carl Rogers. He is worth knowing. Spirituality was part of his helping others model. He believed that people want to do better and are naturally motivated to reach their potential, what he called their highest level of "human-beingness". I love courageous people. I love big thinkers. 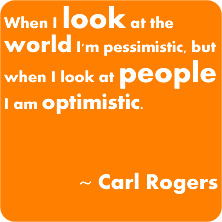 Lots of good thinking is what Carl Rogers did.